I’m 20 years old, so if there’s one thing I know, it’s that the church wants me. It wants young people—passionately, desperately, fearfully. There’s a pulsating panic that the North American church is going to fall apart and die out unless they get young people. The church today has an undeniable obsession with youthfulness. 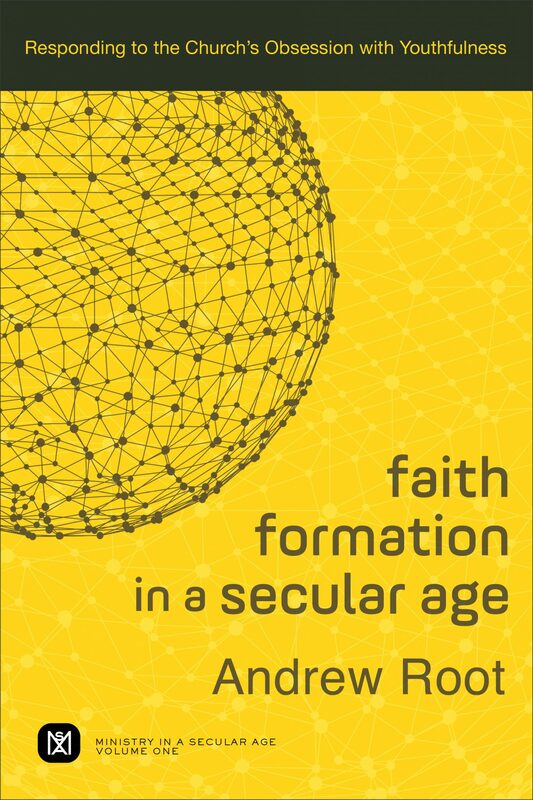 Andrew Root—chair of youth and family ministry at Luther Seminary in St. Paul, Minnesota—speaks into this cultural moment with his new book, Faith Formation in a Secular Age: Responding to the Church’s Obsession with Youthfulness. Building on the writings of philosopher Charles Taylor, Root offers a scholarly yet approachable perspective on what youth ministry should look like—and when it falls short. Root is a meticulous historian, and the first half of the book is dedicated to figuring out how we got here. He traces the last century’s changing philosophy, as society moved from an age of duty and honor to what Taylor calls the “age of authenticity.” Root defines the label this way: “The age of authenticity asserts that we should be directed by nothing outside us but only by what we find meaningful within us” (17). This is the ethos of expressive individualism: Follow your heart, be true to yourself, create your own destiny, define truth for you. And this ethos has significantly changed how we think, work, shop, teach, raise kids—and, yes, even how we form churches. Root is careful to say that not everything about the age of authenticity is false or negative; nevertheless, it has caused seismic shifts that have yielded blind spots. And one blind spot is the newfound cultural obsession with youthfulness. In a culture that values authenticity above all else, young people are deemed the most authentic members. As Root puts it, “Youth became the priests of cool who inherited the practices, perspectives, and predispositions to lead us all into authenticity” (60). If authenticity is the thing we’re all chasing, then we must follow the youth. In a culture that values authenticity above all else, young people are deemed the most authentic members. . . . If authenticity is the thing we’re all chasing, then we must follow the youth. This is obvious in every inch of pop culture. Slick salesmen have convinced us we must look like the youth, think like the youth, talk like the youth, and believe like the youth because they will save our culture. But again, it’s not just secular culture that’s been swept into idolizing youth. Baker Academic (2017). 240 pp. $22.99. Questioning the search for new or improved faith-formation programs, Andrew Root offers an alternative take on the issue of youth drifting away from the church and articulates how faith can be formed in our secular age. He offers a theology of faith constructed from cultural conversation, providing a deeper understanding of the phenomena of the ‘nones’ and ‘moralistic therapeutic deism.’ Root helps readers understand why forming faith is so hard in our context and shows that what we have lost is not the ability to keep people connected to our churches but an imagination for how and where God could be present in their lives. He considers what faith is and what steps we can take to move into it, exploring a Pauline concept of faith as encounter with divine action. It’s why we spend millions of dollars in programs, pizza, curriculum, incentives, and research to get youth to stay in church. It’s why we try to make our churches cool. It’s why we water down the message to make it more appealing. We want the validation of the youth. But even more, we want to capture their spirit. If we can be youthful, we’ll be authentic, and everything will change. Youthfulness can’t save the church. Now, there is obvious wisdom and love in wanting youth in the church—that’s biblical (Titus 2:4–6; 1 Cor. 12:12–25; 1 Tim. 4:12)! But what’s not biblical is building your church’s priorities around youth. What’s not biblical is chasing coolness over gospel. The church’s mission isn’t just reaching young people; it’s reaching all people. But the spirit of our secular age has led “us to chase the spirit of youthfulness over the Holy Spirit, to seek cultural legitimacy over divine action” (15). Youthfulness can’t save the church. But the Holy Spirit can. First, it requires us to recognize that we live in a secular age, and to understand what that means for how we teach. Second, he argues we need to stop viewing faith formation as simply keeping youth in church (that should be the byproduct of discipleship, not the sole purpose). He chides the church for defining faith as “affiliation and participation in an institution.” Instead, we must understand faith the way the apostle Paul did—as an encounter with transcendence and then ministering in the way Jesus did. Root wants to “heighten the importance of the church” (201). But he knows that can only happen when the church knows its true mission: to make disciples of all kinds through teaching, fellowship, and ministry. As a 20-year-old, I’ve felt the furor Root describes: the church’s panicked obsession with my generation. And I’ve seen how this not only hurts the church, but also us youth. For one, it puts a false pressure on us to bring revival, renewal, life, and, ultimately, salvation to the modern church. No generation or demographic can do that. We can effect change, yes, but we can’t change everything. This expectation dramatically minimizes the power of the gospel. If the mission is to keep youth in church, the structure and teaching will be different than if the mission is to disciple youth to know Christ. It also puts a false focus on youth ministry. If the mission is to keep youth in church, the structure and teaching will be different than if the mission is to disciple youth to know Christ. There’s nothing wrong with pizza, but if pizza becomes the pull and the purpose, we aren’t giving youth the true food they need to satisfy their hunger. Youth need to be equipped with a foundation of biblically rich theology in order to grow in faith and face adulthood assured of their identity in Christ. They need space to share their story. They need to be integrated into the intergenerational community. They need to know they’re not the hero of this story, but they are important and play a unique role. What is faith formation in a secular age? Teaching my generation—and yours—to cut out idolatry, to chase the cross over coolness, to love others more than ourselves, and to be conformed to Christ daily—no matter what culture says. Because that’s how the church will be saved. Editors’ note: How did faith go from assumed to assaulted? Probably no book published in the last decade has been so ambitious as Charles Taylor’s A Secular Age. He seeks nothing less than to account for the spread of secularism and decline of faith in the last 500 years. Now a remarkable roster of writers—including Carl Trueman, Michael Horton, and Jen Pollock Michel—considers Taylor’s insights for the church’s life and mission, covering everything from healthcare to liturgy to pop culture and politics. Nothing is easy about faith today. But endurance produces character, and character produces hope, even in our secular age. Order a copy of Our Secular Age: Ten Years of Reading and Applying Charles Taylor now! How Do You Reconnect People Who Have Been Hurt by Their Church?